Jumeirah Group, compañía de hotels de lujo con sede en Dubai y miembro de Dubai Holding, presenta Jumeirah™ Inside, una plataforma virtual que se compone de fotografías y video 360° que permite a los usuarios realizar reservas de hotel y acceder a contenido multimedia nunca antes visto. Jumeirah™ Inside, desarrollada en colaboración con Google, es una plataforma de viaje completamente digital y pionera en el sector, accessible desde jumeirah.com. Jumeirah Group, the Dubai-based luxury hotel company and a member of Dubai Holding, has launched Jumeirah™ Inside- a virtual platform comprising 360° video and photography which enables users to make hotel bookings, access never-before-seen footage, discover hidden treasures and share them with the world. Jumeirah™ Inside, developed in collaboration with Google, is a hotel industry first and offers a fully immersive digital travel platform which is accessible through jumeirah.com. The platform provides access to Burj Al Arab Jumeirah which is brought to life by 360° video, 3D sound, playful interactions and exclusive hotspots - this is not just a tour through a building, it's a journey through a brand. Ross McAuley, Group Vice President of Brand, Digital and Loyalty, Jumeirah Group, said: "Jumeirah Inside is one of the most exciting digital developments for Jumeirah Group. Just as we aim to exceed our guests' expectations whenever they visit our luxury hotels around the world, so is our aim to give an unforgettably rich, immersive online experience in advance of their arrival. This is a world first for the hospitality sector. 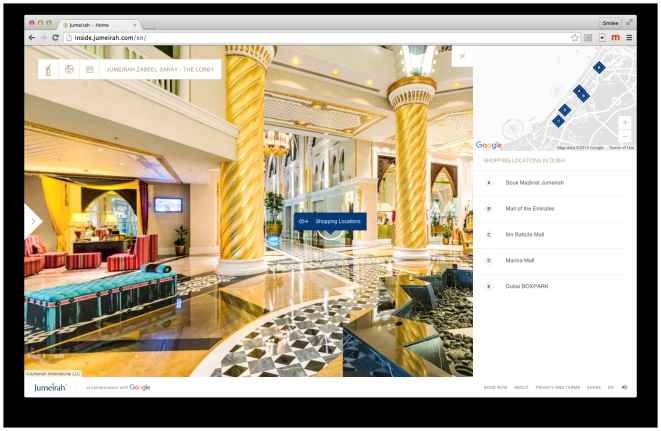 Jumeirah Inside has been initiated for us by Google's dedicated creative team. The platform works across desktop, tablet and mobile devices, in five languages, offering a film-focused exploration of the world's most luxurious hotel, Burj Al Arab Jumeirah. And in so doing it connects that remarkable property back to Jumeirah Group's portfolio of 22 other luxury hotels, our STAY DIFFERENTTM brand promise and the outstanding service guests can expect when they walk through the door of any Jumeirah hotel." Ivan Jakovljevic, Google's Head of Travel & Finance, Middle East and North Africa, said: "We are very excited to see Jumeirah Inside spread its magic to the world. We worked very closely with the Jumeirah team to unleash the creative potential of their brand enabled by the latest advances in digital technology to tell the best possible story from the consumer point of view at every step of an immersive travel journey. Innovation through technology is at the core of what we do and we are always striving to create new ways for our partners to find their audience and create rich personal experiences with them. Jumeirah Inside has set a high example for the hospitality industry of a brand that is pushing the envelope of what is possible through adoption of digital. It is redefining the way people experience travel and we are proud to be a part of it." The virtual journey begins at the world's most luxurious hotel where guests can see, hear and move around like never before. Users can uncover new information and explore the vibrant colours and playful waterworks in the atrium through 360° video. Other experiences include the chance to dive into the Talise Spa infinity pool, take a leisurely stroll through the magnificent Royal Suite, and explore Dubai from the exclusive helipad. From there guests can continue their virtual journey and explore Jumeirah's hotels and resorts around the world. By clicking on 360° photo spheres, which each have informative hotspots, users will uncover Jumeirah's STAY DIFFERENT™ experiences which can be used to inspire their friends through Facebook, Twitter, Weibo, Wechat and Google Plus. Optimised for mobile and tablet users, the site will offer the opportunity to make hotel reservations at any point. The fully immersive experience is available in English, Arabic, German, Russian and Mandarin.